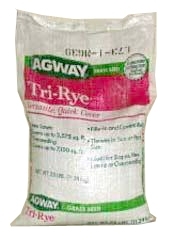 Agway Tri-Ryegrass is an equal blend of 3 turf type perennial ryegrasses. This blend germinates quickly for fast establishment and works well under most conditions, especially full sun. 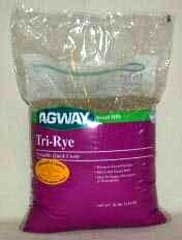 A favorite for over seeding in the fall. One 10 lb. bag seeds 1,430 square feet for new lawns and 2,860 square feet for over seeding. One 25 lb. bag seeds 3,575 square feet for new lawns and 7,150 square feet for over seeding.